Listen to the second installment of our new series leading up to the 11th Annual Annapolis Summit, in conjunction with our print partner The Daily Record, Countdown to the Annapolis Summit. Each week’s installment coordinates with an article in The Daily Record. This week, we discuss Maryland’s budget deficit, with: Senator David Brinkley, Maryland State Senate Minority Leader representing the Fourth District and member of the Finance Committee; Henry Bogdan, Managing Director for Public Policy and Public Affairs at Maryland Nonprofits; and Warren G. Deschenaux, Director of the Office of Policy Analysis for the Maryland General Assembly. 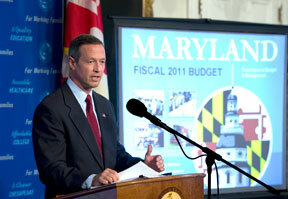 The 11th Annual Annapolis Summit will be held on the Opening Day of the Maryland General Assembly, January 8, 2014, from 7-10am, at the Governor Calvert House in Annapolis. We will begin at 7:00 with a networking breakfast, and then from 8-10 Marc will interview Governor Martin O’Malley, President of the Senate Thomas V. “Mike” Miller and Speaker of the House Michael Busch. Click here for more information.